When is a Dirty Floor Not Really Dirty? Do you sometimes look down at the floor –in the office kitchen or restroom – and wonder why that spot or stain you’ve noticed is still there? You might wonder “Don’t the cleaning people see that night after night? Why don’t they take care of it?” Or maybe there’s an area at the base of the sink or toilet that just never seems to look clean and you think “this restroom just isn’t not clean! Maybe we need a better cleaning company.” And sometimes, floors may simply look dull and dingy – again resulting in the feeling that your workplace is unclean. Surprisingly, your cleaning staff may be doing the best they can in terms of daily floor maintenance. When symptoms such as these occur, it’s usually a sign that a floor needs to be refinished – either by buffing the floor and applying a coat or two of fresh wax, or by stripping the floor of all wax and reapplying several coats. And sometimes, all a floor needs is a scrub and buff – where wax is not removed, but the surface is deeply scrubbed to remove surface stains and then buffed to restore shine and luster. 1. Floor color starts to yellow. When too much wax builds up on a surface over time, the finish becomes discolored. This is usually a sign that the floor needs to be completely stripped of all wax before new coats are applied. 2. Surface of floor looks dull. 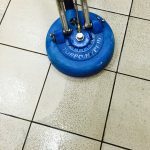 When a floor undergoes too much wear and tear, due to heavy traffic and infrequent upkeep, the finish starts to break down causing lack of shine and a dull, dirty look. Permanent damage can be done to flooring if left unfinished for too long. 3. Staining starts to occur around floor edges – especially around sinks, toilets and other areas where drips occur. 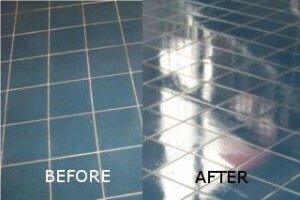 Vinyl tile flooring benefits from daily mopping as well as routine scrubbing and buffing to keep the surface shiny. But, over time, when staining occurs and the stains can’t be removed through routine scrubbing, it’s an indication that some or all of the coats of wax need to be removed and reapplied. Regardless of how your floors look, the most common problem is waiting too long to have the floors taken care of. To avoid these types of symptoms, and to keep your floors looking their best, it’s important to have a floor care plan in place. Floor care experts can assess your needs and determine the best floor care plan for you. And that’s the real dirt on clean floors! 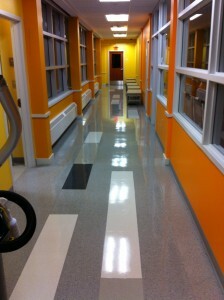 This entry was posted in Floor Care Program, Floor Refinishing, Strip and Wax, VCT tile refinishing and tagged commercial cleaning, commercial cleaning services Worcester, commercial cleaning Worcester, office cleaning, office janitorial, strip and wax. Bookmark the permalink.